Charging huawei Mate 20 Pro meme Do you help charge your friends' batteries? I've come to the realization I'm an anomaly. I have cables usually just about anywhere I go. My desk, my car, my bag, several desks/coffee tables in my house ... and further to that I tend to have a selection of some sort of power bank near me. Typically, if someone around me is making motions that their battery is low I have it covered for them. Apparently, that may not be the case for some people. 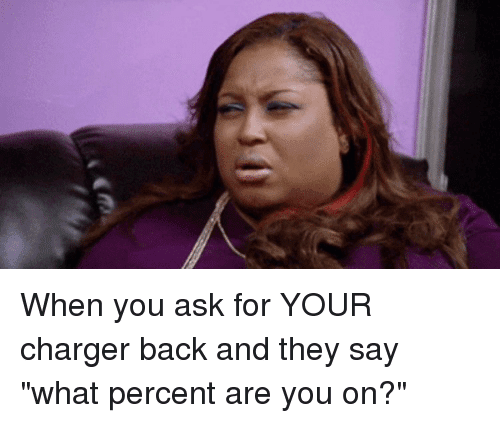 So, I ask you - do you share charging options with your friends? Huawei's new Mate 20 Pro has a huge 4200mAh battery and has the option to share that juice with a friend - even doing so wirelessly! Pretty cool. Huawei Canada conducted a survey and found that 70% said that having a battery that lasts for an entire day is important.